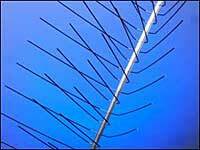 E-Spike from Nixalite is designed to be effective against pigeons and seagulls. The 6-inch wide system is available in 24- or 48-inch strip lengths to speed installation time. It is available in a stainless steel finish or eight standard ColorCoat colors, with pointed or soft tip spikes. Installation is possible via adhesive, stainless steel hardware, glue clips, gutter straps, ridge caps or custom installation brackets. The flexible base follows curves and can be cut to the desired length.